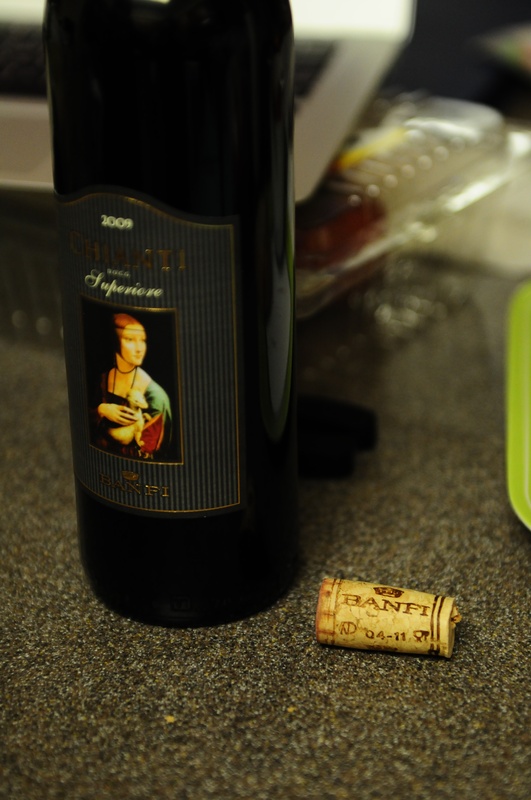 Today we tried a Banfi wine, the namesake of our school’s hotel’s restaurant. Sunnie: I would say it’s very medium body, light on the tannins, and there’s a strong aftertaste. Audrey: What varietal is this? Sunnie: I think it’s just Chianti. Audrey: Definitely not as familiar with that name as ones like Cabernet, or Pinot. Sunnie: Time for some internet research… They age it for 4-5 months in a French oak barrel and after, another 4-5 months in the bottle. It is 75% of the Sangiovese varietal. Audrey: I didn’t know Banfi’s makes this kind of wine. I’m really enjoying this Da Vinci painting on the bottle. This is very easy to drink… it’s almost sugar-y sweet and the aftertaste is not too strong or bitter. Sunnie: Wines with Sangiovese grapes usually taste of ripe black fruits, like black cherries or plums. It’s usually used as a ‘blender’ varietal that’s added on to the local varietal. By itself, Sangiovese is usually too harsh and acidic. It’s the most-planted red varietal in Italy. Audrey: Very cool, I can definitely taste the black fruits. It’s more fruity than floral. Sunnie: Why is it so cheap? I don’t understand… it’s cheap and affordable, so great! Hm… I can definitely taste black cherry.